Updated Monday March 31, 2014 by Vernon Ringette Association - GVRA. 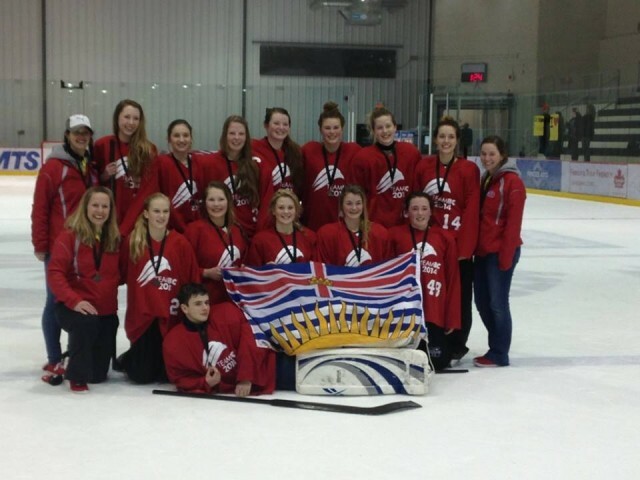 The Vernon U16 "A" Adrenaline Rush team who were recently named "Team BC" at the Provincial Championships in Prince George are the 2014 Western Canadian Ringette Champions! The prestigious tournament was held in Winnipeg, Manitoba and consisted of a round robin formation including comeptition between provincial teams from Alberta, Saskatchewan, Manitoba, and a Host Manitoba team. The Rush opened the weekend by participating in the skills competition where Hannah Popilchak placed second in the fastest skater competition and the relay team of Maddie Powls, Ava Haldane, Kendra Ostafie, and Saige Woodliffe placed first and were awarded with commemorative sticks at the closing ceremonies banquet where Kendra Ostafie was also named to the U16 All-Star Line. The tournament began Thursday, March 27 and the Adrenaline Rush opened with a 3-0 win over the Host team. They then beat Alberta later that same day with a 7-5 win. Day 2 of competition was less successfull as they fell 6-5 to Saskatchewan in an exciting overtime game and then 8-6 to Manitoba. Despite being 2-2, the team ended up finishing second in round robin securing them a spot in Saturday morning's semi-final game and guaranteed them a medal. In semi-final action The Rush doubled up on Host with a 6-3 win which bounced them to the gold medal game where they were awarded with a do-over against the home team, Manitoba. The crowds were huge and the energy was high as the first free pass was made. The game was back and forth in score but BC dominated the majority of the play and came out golden with a 3-2 victory. It was hardwork, determination and pure talent that won this tournament. Realistically any one of the teams competitng could have come out on top as the competition was so close throughout the weekend. The close games made the victory that much sweeter. This is the first time an all Vernon team has competed as "Team BC" at the Western Canadian Championships and the first time an Okanagan team has won gold. Gold has only ever been won twice before by BC teams, both from the Lower Mainland in 2012 and 2006. Team Roster: Garrett Adams (G), Shelby Connors, Alex Drury, Ava Haldane, Saylor Martian, Kendra Ostafie, Katelyn Paulin, Maddy Percy, Caleb Pope, Hannah Popilchak, Maddie Powls, Taigan Radomske, and Saige Woodliffe.